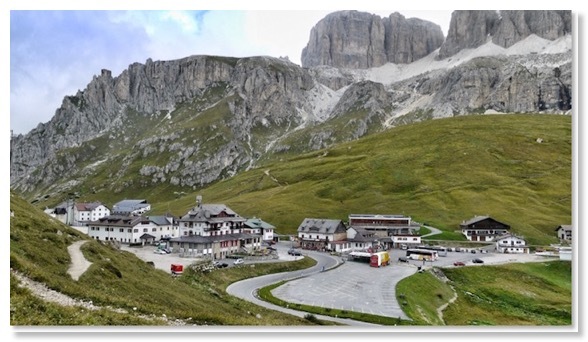 Passo Pordoi tops out at 2,239 metres, and is a major gateway between the western and eastern Dolomites. 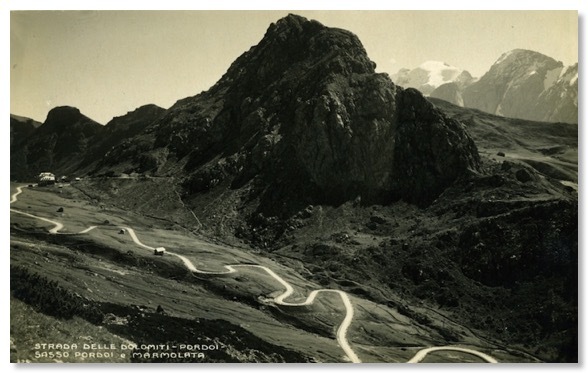 It is the highest point reached by the Great Dolomite Road. 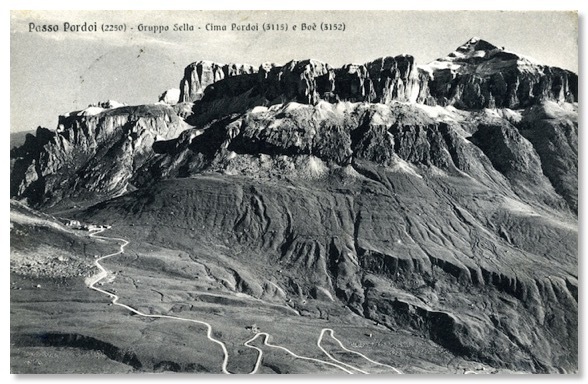 Zardini’s photograph looks south east, over the summit of the Pass itself, across the intervening ridge that runs from from Col di Rosc to Padon, and over towards the glaciated northern slopes of the Marmolada, which is some ten kilometres away as the crow flies. 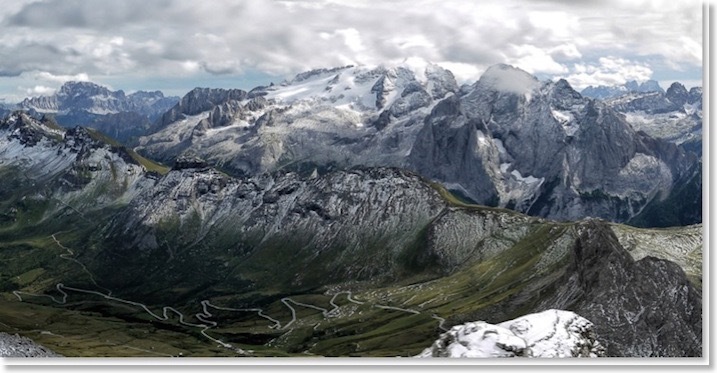 The Marmolada is the highest peak in the Dolomites, at 3,343 metres, and contains by far the region’s largest glacier. 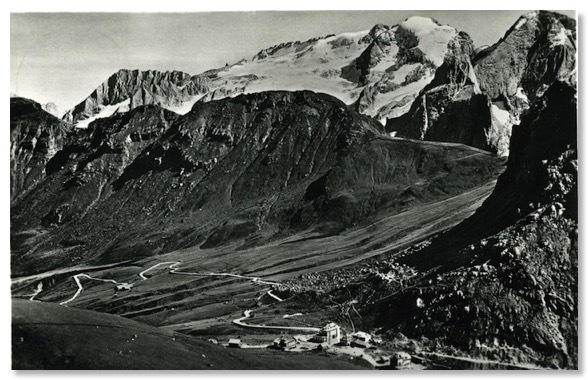 Relatively little that is actually visible in this view has changed since the Zardini photograph was taken. It took me a surprisingly great deal of scrambling across trackless steep slopes of rock and grass to locate the approximate point from which the photo had been taken. This intrigues me still, because there are equally good viewpoints, lower down and far more easily attained. 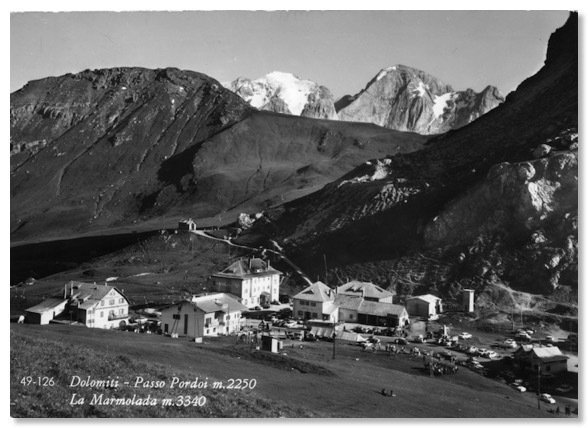 The Zardini photograph shows the Albergo Savoia, to the left of centre. 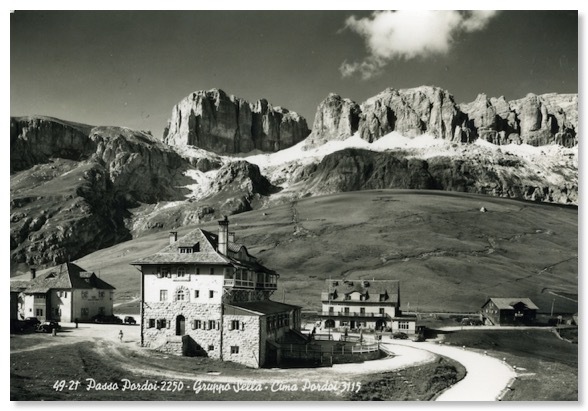 This venerable hotel still offers comfortable accommodation today and has a wealth of old photographs on the walls of its restaurant area, many or most being contemporary with Zardini’s work on the Great Dolomite Road. 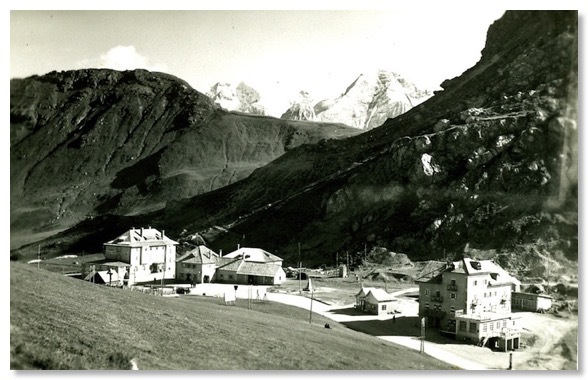 Right of centre is the Albergo Col di Lana. 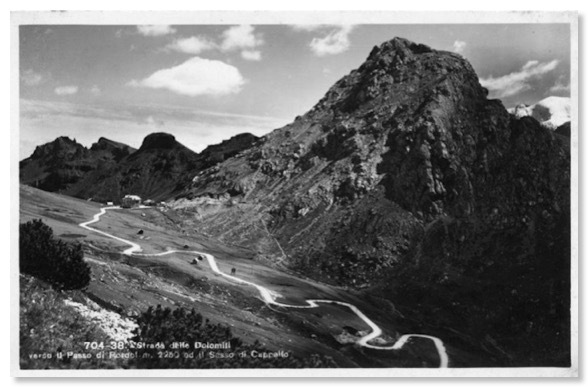 The Savoia is from the late 19th century, the Col di Lana dating from the time that the Pordoi stretch of the Great Dolomite Road was completed, in 1909 or thereabouts. 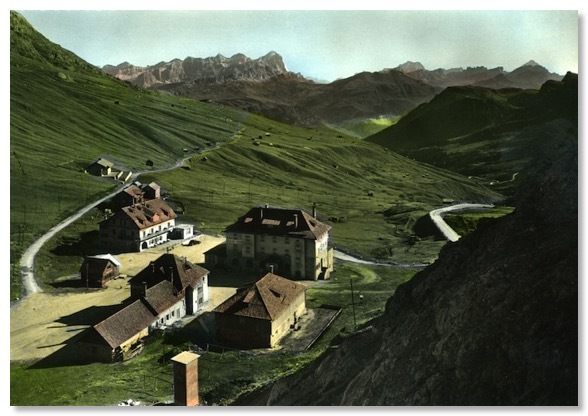 The Savoia began life as the “Christomannos Haus” - see postcard photos elsewhere on this web page. 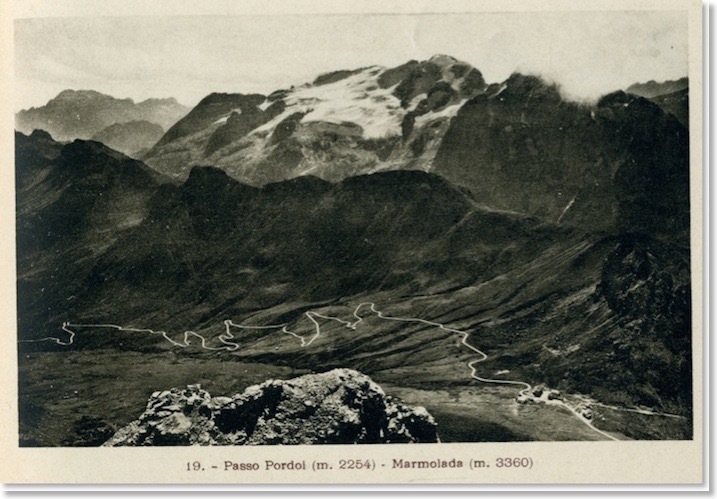 Neither it, nor a road through the pass are mentioned, for example, in the very thorough 1905 Baedecker guide to the area. 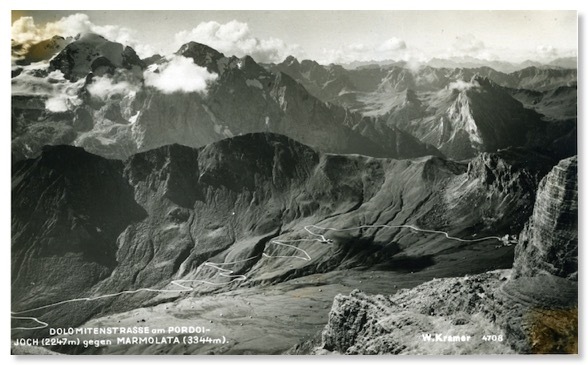 In both the Zardini photo and my modern equivalent, the horizontal line of the previous stony track to the Pass can be seen, just above the modern-day carparks. 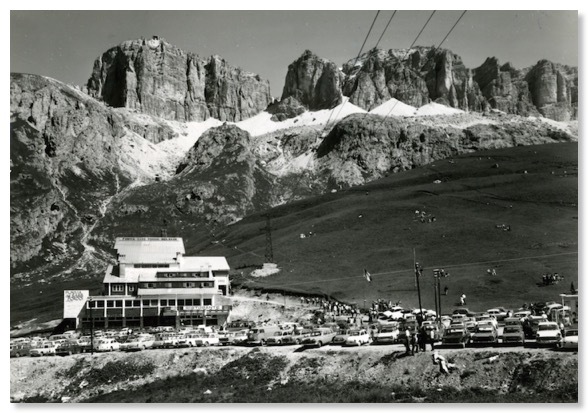 The major change in the view is the intrusion of the Pordoi cable-car station and the car parks that have grown steadily to accommodate tourism here. 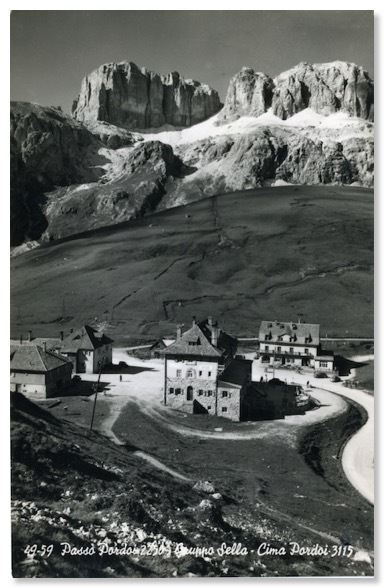 Thankfully many of the weekend flea-markets that used to clog the Pordoi and other passes seem far less frequent. 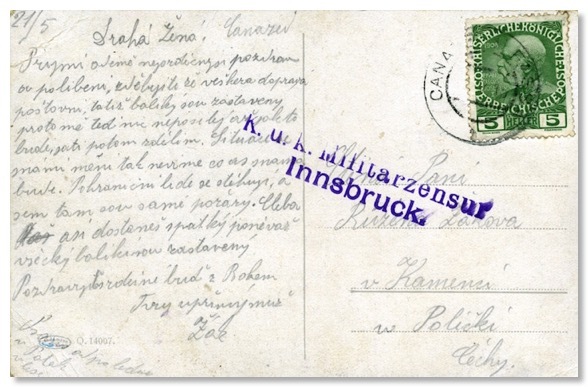 This card is undated, but also probably from the same era. The absence of traffic is unusual in all of the cards from this time. The area was certainly seldom without cars and coach parties, particularly at summer weekends. 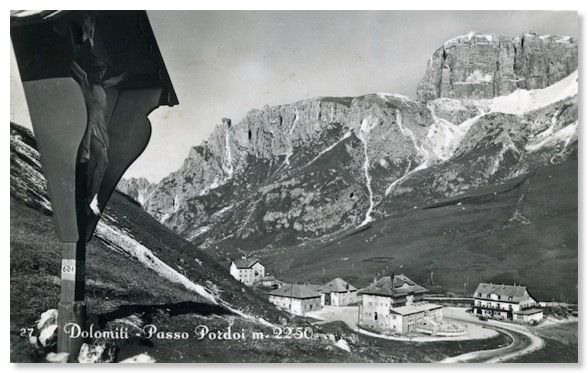 Passo Pordoi was, and remains, a major spot for visitors to congregate. 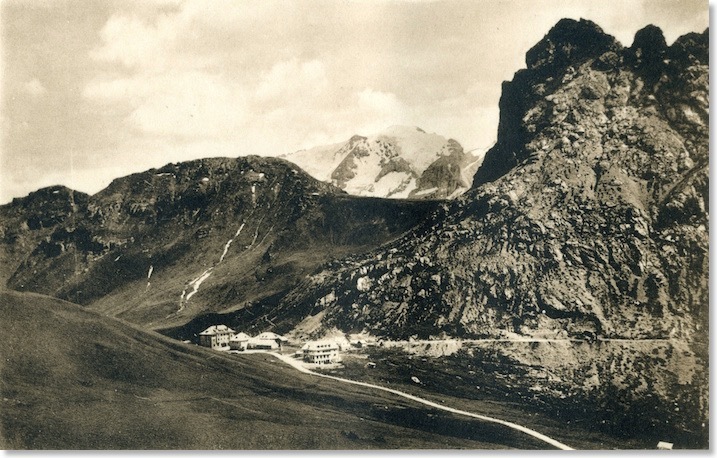 All the general views across the Pordoi Pass summit show a significantly different, slightly smaller, building on the site of the Albergo Col di Lana compared to Zardini’s photograph. My assumption is that the original building was destroyed in the First World War fighting, and replaced by one that has, in turn, been replaced by what, today, stands behind the cable car station in my own photograph. Several of these early cards clearly show the memorial from Photo 15. The keen eye will also spot the crucifix to the graveyard of Photo 16 in some, too. The viewpoint is very nearly identical. Car parking seems rather unregulated, with vehicles parked right up against the obelisk of Photo 15. One of my treasured postcard purchases is this painted representation of the area. 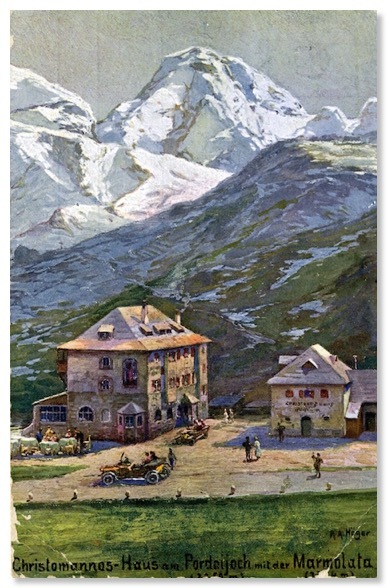 It somewhat exaggerates the Marmolada peaks in the background, but names the main building at the summit of the pass as the “Christomannos Haus”. 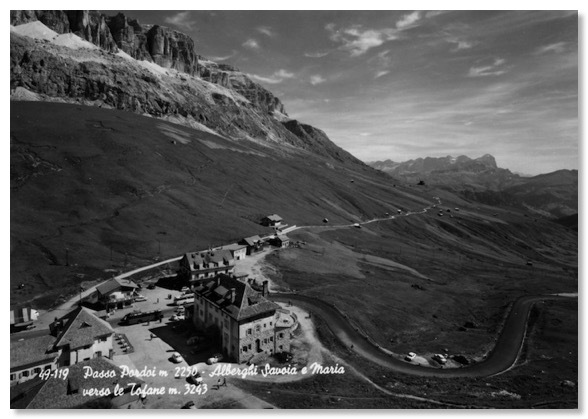 I am satisfied that this, a few minutes walk from the Rifugio Maria, between Sass Pordoi and Piz Boe, is the site of Zardini’s photograph. 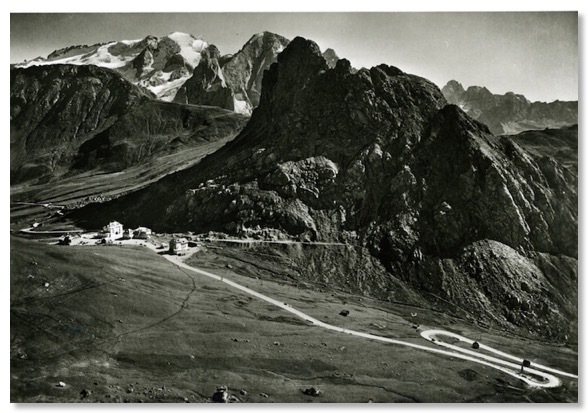 However, my 2013 visit confirmed that the photo actually seems to have been taken from higher up, on the peak of Piz Boe, at around 3,000 metres. Snow conditions were too difficult for me to reach there in 2013. 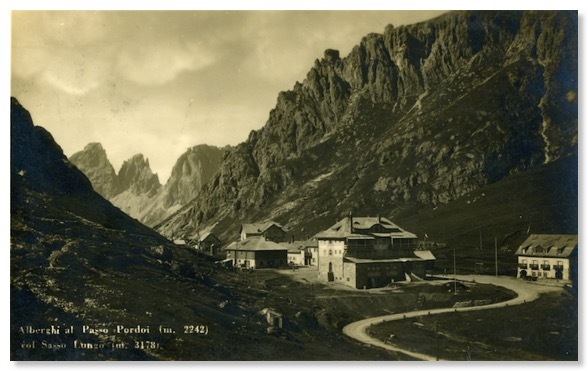 Here is a postcard, dated 9 July 1937, which shows the view in the exact opposite direction to Zardini’s shot, looking up to the flat top of the Sas Pordoi, on which the cable car station now stands. 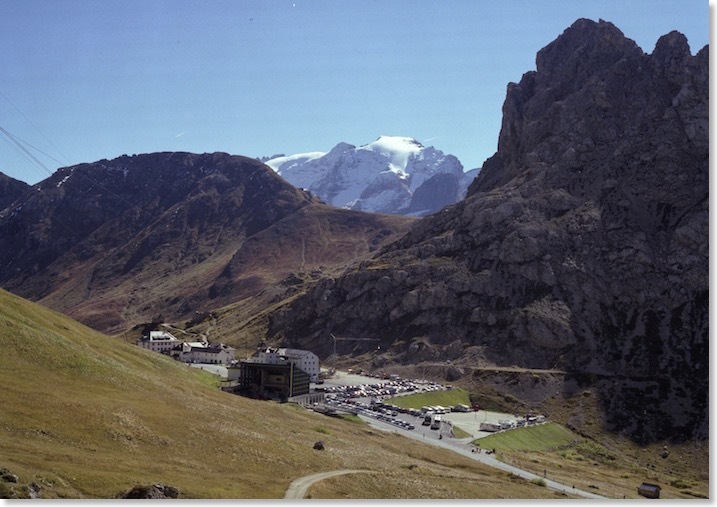 The conical peak to the right of shot is the Piz Boe.